Read more on Intel's X299 12-18 core CPU pre-orders. I'm rather shocked that AMD has such better base clock speeds. Kinda impressive tbh. I'd like to know which CPU holds the edge at Max OC though. Well considering AMD's are lower in price AND is soldered, which has much better heat transfers than TIM, I am so disappointed in this lineup from Intel. The 18 core intel CPU will probably overclock better than any of the Ryzen CPUs. Already seen the 10 core 7900X doing 4.8 so I think the 18 core version will manage about 4.3 or 4.4. 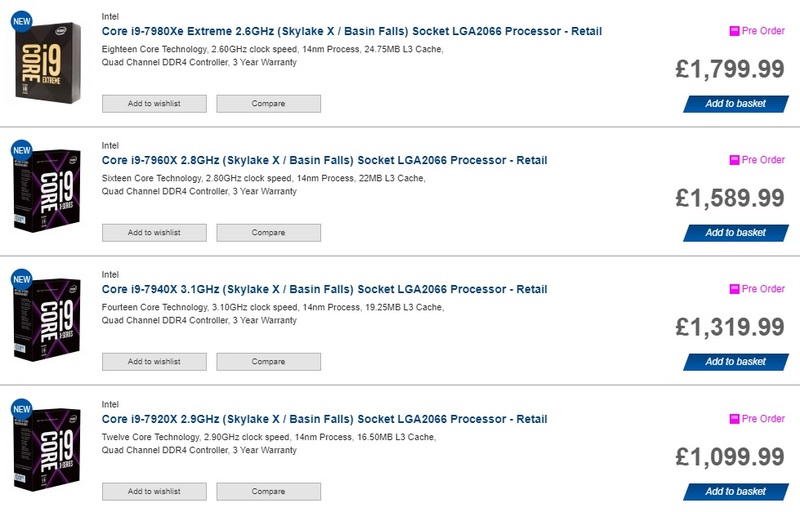 I know they're not the same but considering how much we paid for Xeon E5-2699v3's (which is essentially the same spec as the Core i9 7980XE) then these are a steal. With AMD being so much cheaper, why would anyone bother with these unless they really needed the 18 core variant. Even then, save an extra £200 and get yourself 2 threadrippers! Yeah but AMD were not in the game then. 32 core single socket Epyc is $2000. Or about £1800. no reason at all.... that is why i swicthced from intel back to amd after 10+ years. This entire line is starting to be a pretty obvious kneejerk reaction, to Threadripper, by Intel. You'd have to be a little special in the head to buy these.